Preheat oven to 325 degrees F. Heat bacon fat in a four quart or larger dutch oven over medium heat. Add onion and garlic and cook for 7 minutes until softened. Increase heat to medium-high and add sausages, browning for 3-4 minutes on each side. Add caraway seeds, cooking for an additional 2 minutes. Pour in red wine vinegar and cook for about 2 minutes, until reduced by half. Add cabbage and continue to cook for 5 minutes or until cabbage has wilted slightly. Add broth and salt. Cover and transfer to the oven. Cook for 45 minutes or until cabbage is cooked through. Fish out the brats and transfer to a cutting board. Slice each brat into 5-6 pieces, then add back to the braised cabbage and stir. Sprinkle with chopped parsley if you want to add a bit of flair and serve warm. You can sub apple cider vinegar for the red wine vinegar in a pinch. 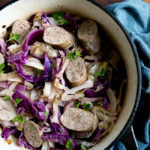 If you’re using pre-cooked sausages, skip the browning step and add them to the dutch oven when you add the cabbage.